We’d like all parents/ guardians to attend the evening. Your son/ daughter is asked to make appointments with their teachers prior to the evening to ensure that times are scheduled and your visit is planned effectively. 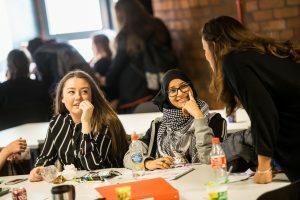 As you’re aware, Year 13 students are preparing for vital mock examinations – therefore this is a good opportunity for you to discuss your son/ daughter’s progress with their subject teachers and ensure you understand what is needed to secure their target or destination grade in each subject area. As well as this, many of the students are in the process of completing their application for university, using the UCAS application system. With this in mind, Mr McCann (Head of 6th Form) will be delivering two parental information UCAS sessions in the cinema. All parents of students applying for university are encouraged to attend one of these sessions. If you’re unable to make the parents evening, have any questions or would like to meet staff to discuss issues arising through the reports, please contact 6th Form pastoral manager (Mr Clegg – [email protected]). He will be able to direct your comments or questions to the appropriate people.